Embed Webex Teams functionality directly in your web apps with Widgets. Each Webex Teams Widget represents a single product feature of the Webex Teams clients. They are built with React and Redux, and use the Browser SDK to communicate with the Webex Platform. Widgets can be included directly in your web applications, giving you the ability to customize the Webex collaboration experience. They come pre-built with the Webex Teams User Interface (UI) and may be styled to tailor them to your brand. They can be used by either current Webex users or guests by authenticating with an auth token provided from an integration or a guest issuer app. To add widgets to your web application, it's as easy as including some simple code in your app. In this example, we'll add the Space Widget to a page and join a Webex Teams space. To try this example, replace ACCESS_TOKEN with a valid auth token for the Webex REST API (see Integrations or Guest Issuer) and SPACE_ID with the ID of the space you'd like to open. Upload the code to a webserver, or use a local webserver such as httpster, to see the Space Widget in action. For more information about using the widgets, see below. 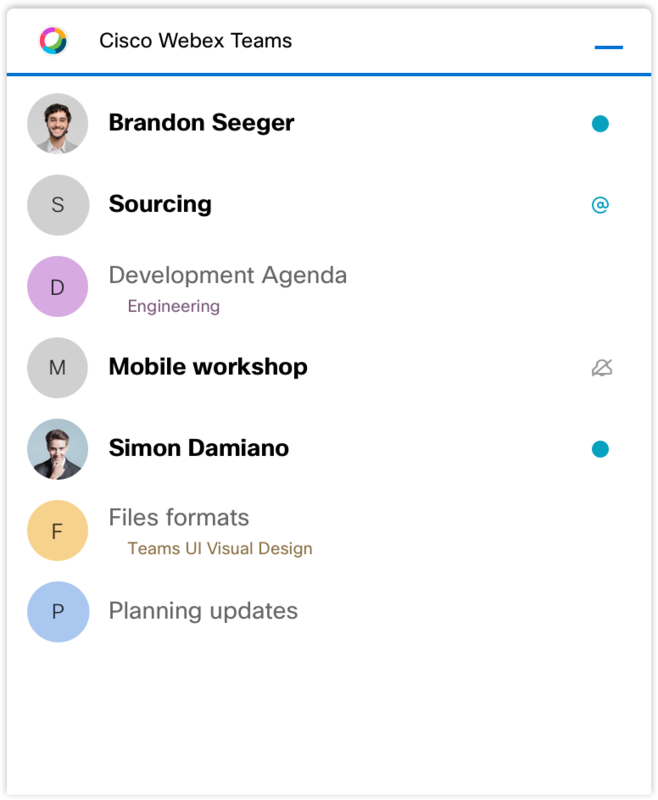 Include Webex Teams space functionality in your app. This widget provides the calling, meeting, messaging, and content sharing features related to spaces. Join 1:1 or group spaces to collaborate via messaging, calling, or start and join meetings, all with the familiar Webex Teams UI. To use this widget, you'll first need to create an integration with the following scopes: spark:all. For more usage and configuration information, see the Space Widget Usage documentation in GitHub. Display a list of Webex Teams spaces and respond to real-time events. This widget includes a list of recent Webex Teams spaces and can act as a central event processing hub for events happening within the Webex Platform. For more usage and configuration information, see the Recents Widget Usage documentation in GitHub. See the Recents Widget Events documentation in GitHub for more information about event handling.